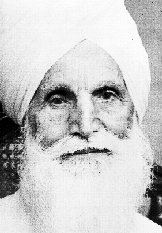 Bachan Singh was a carpenter -- a Satsangi -- a disciple of Baba Sawan Singh Ji. He worked in Sawan Ashram any time he was needed and accepted no payment. Sometimes he would get a strong urge or inner pull -- in his own words "become helpless" -- and make his way to the Ashram, taking up any work required there. Here is his story -- how he came to the feet of his Master and various incidents in his life -- as told to the SAT SANDESH staff. It was first printed in the February 1970 issue of the magazine and reprinted in the July 1973 issue in response to many requests. FROM CHILDHOOD I had a strong desire to find God. As a small boy I promised myself that one day I would meet God and I would put my arms around Him, and He would also hold me tight and I would say, "Hello God, who are you?" Those were childilke thoughts; but the desire stayed with me and when I grew into manhood I was still searching for God. Being a Hindu I frequented the temples and, with unswerving constant faith and sincerity of heart, offered my devotions to the various images installed there. Many years went by without any experience of God, who it seemed did not choose to come to me. Finally I thought that perhaps God did not come to Hindus, so I joined the Sikh faith and started attending the gurdwara to listen to the sacred words of the ten Gurus, contained in the holy book -- the Guru Granth Sahib. The words of this great book served to increase my devotion, and I would listen, enrapt in the chanting of the verses. However, as time wore on and I was no nearer to the Truth, or any real experienceof God, I began to suspect that God was not to be found in buildings. Although the Sikh religion had given me added incentive to desire God-knowledge, and had been the means of increased devotion growing in my heart through the beautiful words of the great Gurus, the words were just words after all, and I was still far from God. Once again my mind filled with confusing thoughts, so I stopped frequenting all holy buildings, concluding that there was no God anywhere. Life was frightening, having no God. I felt alone and very bewildered. With no God and no Truth in the world, what was the purpose of living? These thoughts went round and round in my mind for days, until at last I decided that the best thing was to commit suicide and finish my purposeless life. I made my way to a deep well outside the town. Before making the jump I suddenly remembered that I had read somewhere that one should sit down quietly with closed eyes and think deeply before starting any important task; so I sat down beside the well, deep in thought. While in this position, I saw a smoky haze come in front of me, through which a figure emerged -- a thin-faced man with a turban and white beard. I thought that it must be Guru Nanak (the first Guru of the Sikhs). He smiled at me and told me not to worry. When I opened my eyes, there was no one there, but I felt strangely at peace; so I got up and went back to the city. Some days passed without seeing any more of the beautiful figure, whose presence had given me a surge of hope within my heart; so I began to presume that it was not really a vision but a dream. The thought of ending my life again arose and I resolved that the second time I would make the jump. As I reached the vicinity of the well once again, with my eyes open I saw the hazy mist coming and then the same figure of the bearded Saint appeared. This time he comforted me, telling me not to worry: "You will get what you want," he said; and with this he left me. Such demonstration of power before me, without even closing my eyes and sitting quietly, impressed me greatly and I felt that God was telling me that He really did exist. So 1 turned around and went home. Some years went by without any further experience, and although my faith in God had been somewhat restored, I kept away from religious places. My work as a carpenter took me once to a building in Daryaganj, Delhi, where I was working on the first floor. A fellow carpenter was also working there and one day he said to me, "My Guru has come to Delhi, and he is going to hold Satsang on the floor above." I told him that I had no desire to go, but due to the loudspeakers I could hear the talks from where I was working. The sound of the speaker's voice and the nature of his talks were very attractive and seemed to draw me from inside myself. My friend was missing from work for four or five days and when he finally turned up I was a little annoyed and asked him why he had left the work without any warning. He told me that his Guru had taken the train to return to Beas, and he had suddenly jumped aboard also, to spend some more time near his Guru, and had therefore been staying in Beas. I told him that it was very strange that a man could leave his work to run after a guru, but my friend assured me quite confidently that his Guru was God Himself in human form. "How can you be sure?" I asked. "Because he gives practical experience and shows you the Truth inside yourself," replied my friend. A peculiar feeling filled my heart and I quickly asked him to describe his Guru. He then described perfectly the same holy figure I had seen some years before. "You must take me to him!" I said, full of excitement. My poor friend explained that he had just returned from there and could not afford another trip immediately; but when I offered to pay all his expenses, he would not hear of it. "What! Take another man's money to have the darshan of my Guru? Never!" He said he would gladly take me and pay his own expenses. When we arrived at Beas station it was very hot and we had to walk a considerable distance to the Dera; and after a few minutes walking I began to feel sick with the heat. Just then a huge cloud came and obscured the sun's rays, and remained overhead until we reached the Dera. Satsang was going on, and there, seated on the dais, was the man whom by now had come to mean so much to my anxious hopes for the future. My desire to get near him was very strong. At that moment the rain started to fall in large drops. The Master stood up, saying that the Satsang would be postponed to enable the people to go to shelter. Everyone stood up, and I took the opportunity to push through the crowd until I was right at the front, very near the Master's feet. Suddenly the rain stopped, and the Master sat down again. All the people including myself sat down also, and the Satsang was resumed. Baba Sawan Singh Ji, the great Master who had appeared to me at the most difficult moment of my life, looked directly at me and smiled; in that moment I knew that I belonged to him. That is how I met my Guru and was initiated there at Dera Baba Jaimal Singh, afterwards returning to Delhi a much happier man, having found that which I had been seeking for so long. Regularly I would visit Beas to have the blessing of my Master's darshan. His private farm was at Sarsai, and the followers were delighted when they were allowed to visit there and help in whatever work was going on. We used to take one month's leave each year to spend there on occasions when the Master was in residence. This selfless service was done with great love in our hearts and an overflowing joy at being near him. During one visit I was spending my days doing some carpentry work, and in the night I would help with the building that was going on. One night we were building a high wall, and the Master was sitting in a chair nearby, watching the work. The kitchen bell rang suddenly and the Master advised us to go and have our evening meal. Everyone left, but I was anxious to complete the section I was working on, so I thought I would go in a few minutes' time. However, I went on laying bricks, and forgot everything else, until I realized it had become dark. I was on the top of a ten-foot high wall and there was no ladder to climb down. My head started to spin -- if I slipped I would fall on the stones and probably break my neck. Some yards aong the wall the height was only about six feet, and if I could get to that place, perhaps I could jump to the ground from there. Slowly, feeling very frightened, I walked along the wall, looking only at my feet that I might not lose my balance. Being so deeply engrossed in all this, I had not noticed that the Master himself was standing some distance away, watching my movements. As I started to walk, he also walked toward me. When I finally jumped from the six-foot wall I jumped right into the Master's arms, which were extended to catch me. He held me, and I was so surprised I was speechless. He smiled and said, "Now you can ask me who I am." My thoughts flashed back to my childhood, and I knew, deep in my heart, that my Master had always been with me. I remember once when I was walking along the street in Sarsai I saw the Master's car traveling toward me. Baba Sawan Singh Ji was sitting inside and I folded my hands, delighted to have his darshan. The car stopped and the Master put out his hand to beckon someone. Although he was looking in my direction, I never imagined that he wanted to speak to me, so I quietly stood there. Again he gestured, and wondering who the person could be I turned round, but there was no one in sight. The realization dawned upon me that the Master was calling myself! -- the life just left me and I trembled, thinking, "What have I done now?" The Master was waiting, so somehow I managed to push myself to the car. The Master said, "Bachan Singh, go to Delhi and settle down there. Do not live in your village any more. I am going to be in Delhi and there will be work for you there." I left my village and went to Delhi. Not knowing anyone and having no money, I built a small temporary hut from mud to live in, and with my carpenter's tools I went from house to house looking for work. My efforts were successful and with my Master's grace I found plenty of work. Some people even trusted me with large sums of money to purchase wood. I would ask them, "Why trust me with so much money? -- you do not know me, I might steal it," but they would insist that it was all right. So with all the blessings from my Master, I prospered. We should be grateful for material blessings, but they have little value compared to spiritual things. Great sorrow came upon me when the news came from Beas that my Master had left the world. It was a blow that took the joy out of working and indeed from every phase of life. It was something that a person cannot describe. Several months later I learned that Sant Kirpal Singh Ji, my Guru's most devoted disciple, had come to live in Delhi to carry on my Master's work. I went to Radio Colony where he was living to have his darshan. Naturally there were questions in my heart as I went -- would that same Power be in him, as it was in my Master? Was he truly the appointed one to continue the great work of giving the holy gift of Naam to the seeking souls? From the first meeting I was given such strong assurance, that has never since been broken. While sitting at his feet, his face changed completely, and there appeared the face of my own Guru, Baba Sawan Siagh Ji. I saw this not once, but many times. Although I lived many miles from Radio Colony, I would go there every evening after my day's work, to sit for one or two hours with the Master. One evening for some reason the Master was very stern with all the people present, telling them to go to their work and not to while away so much time there. Pondering over the Master's words, I walked slowly to the gate, but on hearing my name I turned and saw the Master coming toward me. "Bachan Singh, come at 7 a.m. tomorrow, for there is some work for you." My mood changed at once to happy rejoicing, that the Master was not annoyed with me, but had actually called me for some work. The next day I arrived at his house sharp at 7 a.m. and the Master was waiting. He climbed on his bicycle, telling me to do the same, and I followed him, cycling for about four or five miles across a wilderness, which nowadays is fully built up. Eventually we came to a plot of wild land near a railway line. There waiting were four or five other people and we all went around the plot to inspect it. There was an old well in one corner in a half-ruined condition, and a bucket and rope beside it, which presumably some people were using to draw water for washing clothes, etc. One of the disciples picked up the bucket, cleaned it with water and clay and drew some clear water from the well. After standing it on the side of the well he folded his hands to the Master and requested that the Master please quench our thirst. 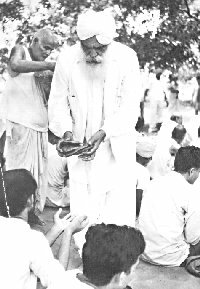 Straight from the bucket, the Master poured water into our cupped hands; and one can say that this was the very first blessing from the Master upon the future Sawan Ashram site -- that very place where he would quench the thirst of ages for many thousands of souls. The work began soon after that, clearing the plot, cutting unwanted bushes and trees. The willing devotees carried clay on their heads to level out the surface. I am reminded of one instance when the Master himself picked up an empty basket and put it in front of those who were filling up. But they all folded their hands in protest, saying, "No, no, Maharaj Ji, not you." The Master asked, "Is there no one who will obey, and fill up this basket for me?" I was there, and I stepped forward. "Yes, I will obey," and I filled it up, pressing down the mud until it was overflowing. Then with difficulty I lifted it up and placed it on the Master's head. Folding my hands together, I said, "Maharaj Ji, you can take any burden!" The Master laughed and walked away with the basket. Many people came to serve, and the Master gathered them around and said, "I do not want peoplc who are conscious of their wealth. I only want the poor and humble. Those who work will have to forget their homes, clothes and money and come in humility as a poor man. This is the kind of work I want." It was yery beautiful to see men and women, sometimes coming in cars and wearing expensive clothing, but not caring at all, bending their backs to the muddy work. Everyone had smiling, soil-streaked faces as they blended the work with joyful singing of holy hymns. Those were very wonderful days, not easily forgotten. I worked there day and night. I had Rupees 100 when we started, which I spent gradually, on myself and others, so I borrowed 100 more, and that went too. The news reached me that my hut had blown down in a storm, so I had no home, little clothing and no money; but inside me there was a deep sense of happiness and well-being from the privilege of working near the Master. In those days there was a small group of people who were against the Master starting an ashram and were trying to break the satsangis away through various means. 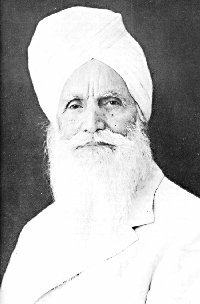 They came to me frequently, and repeated many times that the Master was not Baba Sawan Singh's true follower, but was instead the negative power. After many attempts in vain, they almost convinced me one day, and I began to wonder about it. However, I thought that before making up my mind I should go to the Master once more. Arriving at the Ashram, the building of which was now basically complete, I saw the Master standing there as if awaiting me. He looked at me as I approached, and suddenly I could go no further; for there standing behind him was my Master, Baba Sawan Singh, and behind him was Baba Jaimal Singh Ji. Baba Sawan Singh Ji looked at me significantly, and putting his hand on Kirpal Singh's shoulder he said to him,"This is all yours; you have to look after many souls." I saw Sant Kirpal Singh Ji fold his hands and bow down to his Master, saying, "Whatever you wish." With deep sadness I realized how foolish I had been to allow people to influence my thought, and faith in the Master. Many many times have I had this wonderful experience of seeing my Master appear with Sant Kirpal Singh Ji. I have never told these things to anyone, but today I feel there is some purpose in doing so. I pray that I will always be grateful to my Master and to the present Master for the kindness, love and protection they have showered upon me.